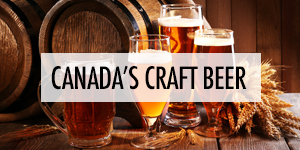 Each week we profile a different Canadian Food Blogger who is part of the FBC community. This week meet Leanne, the Newfoundland food blogger who focuses on whole ingredients with the occasional decadent treat over at Crumb Top Baking! The kitchen has always been my comfort zone, and I love to spend hours cooking, baking and pouring over recipes. So when I was looking for something challenging and creative to do in my hours away from my day job, a food blog seemed like a natural fit. It allows me to share my passion for food and clean eating, but also provides me with the opportunity to learn so many new skills, including food photography and website development. Once I decided to start a blog, I spent weeks thinking about a blog name, as if it was the most important decision in the world! I tested a lot of names with family and friends, but always kept coming back to Crumb Top Baking. I thought it was fun and catchy, but wasn’t too specific, which was important since I wasn’t exactly sure what direction my blog would go in. In hindsight, Crumb Top Baking doesn’t exactly elicit images of clean eating, but I still love the name! I share mostly clean eating recipes on Crumb Top Baking, with the occasional decadent treat. My recipes focus on reducing processed ingredients where possible, and incorporating a lot of lean and plant-based proteins, as well as plenty of fruits and vegetables. But life is all about balance, so I like to throw in a few decadent treats along the way too. Is your blog your business, your hobby or something in between? Right now, I would say it is something in between. I started my blog as a way to share my recipes and channel my creativity, but I quickly started treating it as a business in the hopes that one day it will be. What post on your blog most encapsulates you and why? Wow, that’s such an interesting question. I would have to say the post that most encapsulates me is my Savoury Sweet Potato Breakfast Skillet. Breakfast is absolutely my favourite meal of the day (I actually go to bed thinking about it! ), and while I’m quite content to eat peanut butter and chia jam toast every morning, this skillet speaks to everything I enjoy. It’s a great brunch dish, and I love hosting brunch! But it’s also perfect if you’re craving breakfast for supper or need a one pan healthy recipe for your weekly meal prep. Which post do you wish received more love and why? I posted a recipe for Roasted Red Pepper and Butternut Squash Soup last fall, and it’s probably my favourite soup recipe on the blog. While butternut squash is popular during the fall of the year, I make this soup year round. It’s thick and creamy, and the roasted veggies and seasonings add a smokey, spicy flavour. It’s definitely a recipe that soup lovers would enjoy. Which post’s success surprised you and why? My recipe for Dark Chocolate Peanut Butter Mounds is quite popular, but I never would have expected that when I developed the recipe. It’s just your basic peanut butter ball but with a clean eating spin. I actually created the recipe for myself because peanut butter balls are one of my favourite treats. But I was happily surprised when it resonated with others too. What’s your biggest challenge as a blogger? I think every blogger feels the pressure of time. 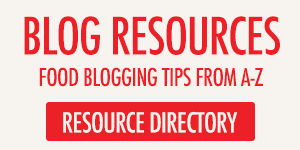 There is never enough time in the day to do all that we want and need to do with our blogs. When I started, I didn’t fully appreciate the number of hats I would need to wear while running a blog. The recipe development, food photography and post writing are just one aspect. There is so much more in terms of website maintenance, marketing, finances, social media and business planning. In some ways it’s exciting to be the jack of all trades for my blog, but it’s also a challenge to stay focused on what will move my business forward. I can’t do everything, so I just need to focus on the most important tasks, and accept that the other tasks will have to wait. What is the biggest lesson you’ve learned as a blogger? The power of community and the importance of the support that comes from other food bloggers. I initially thought that blogging would be a very competitive industry, but I quickly learned that there are lots of opportunities for everyone, and that bloggers are genuinely interested in supporting and helping each other move forward.I’ve learned so much from the blogging community, and those I’ve reached out to have been more than willing to offer their time and advice. Share a couple of your favourite food blogs to read. Why do you like them? The first food blog I started reading consistently was Pinch of Yum. I fell in love with Lindsay’s recipes, photography and style of writing. It was her blog that first inspired me to start my own. And after meeting Lindsay last summer at one of her food photography workshops, I’m even more of a dedicated reader now! I’m also a longtime fan of Tieghan with Half Baked Harvest. Her recipes are so creative and her photography is ridiculously good. So inspiring! More recently, I’ve been following Joanne at Olive and Mango. Her recipes are relatable but always have a unique spin. She is Greek Canadian living in the Caribbean, and she often emphasizes these different elements in her recipes. She also has an amazing Instagram account! Editor's note: tune in next week to read our interview with Joanne! Favourite food - care to share a recipe or a restaurant destination? We eat a lot of tacos in our house. They are just so easy to pull together, and perfect for a busy weeknight or a large family gathering. My tacos always tend to be on the clean eating side, so my Slow Cooker Apple Cranberry Chicken Tacos are my go-to recipe. 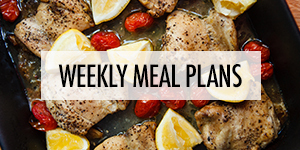 I’ll slow cook the chicken on the weekend, and enjoy various types of tacos and taco salads during the week. What are you working on next for your blog? I’m just about to celebrate my one-year anniversary of blogging, so right now, my focus is on continuing to produce quality content for the readers of Crumb Top Baking. One of the recipes I’m currently working on is another chicken taco recipe. What a shocker! What else should we know about you that may or not be in your “About Me” page? Oh my gosh, my “About Me” page could definitely use some updating! My close friends and family know that I keep things pretty close to the chest and, up until about a year ago, I had never been active on social media. So when I announced that I was starting a blog, it probably took some people by surprise. It’s definitely a bit outside my comfort zone, but a zone I’m happily expanding through Crumb Top Baking! I think my voice and experiences make my blog unique. But if we’re talking strictly recipes, I think mine are unique because they aren’t your traditional clean eating recipes. I like to take common recipes and put a clean eating spin on them, while also throwing in a decadent treat here or there. 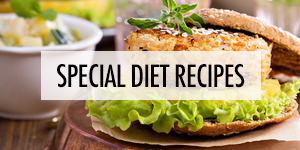 My goal is to create recipes that reflect a balanced approach to food and healthy living. What part of the FBC site do you find most useful? 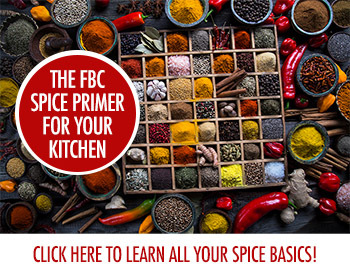 Like so many others, I would have to say the resource section of the FBC website has been invaluable, especially during the first few months of setting up my blog. And now that my blog is up and running, it’s a great resource for the many specific questions or issues that come up on a daily basis. 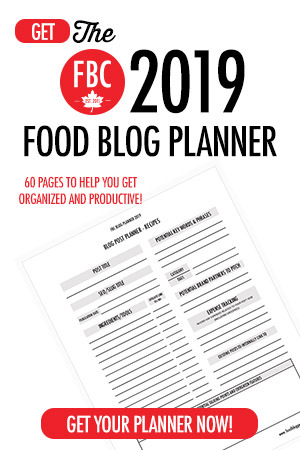 Many of the blogging resources available are American based, so it’s great to have a resource tailored to Canadian food bloggers. 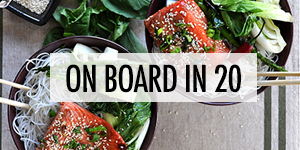 The recipe roundups are also a delight to read, and always remind me that we have some truly talented food bloggers in this country producing some amazing content!